With the flags lowered and cash tills closed, IKEA China yesterday announced the closing of its Beijing store and the opening of bigger premises in the capital. The new store in Siyuanqiao will be open for business from tomorrow. For the world's leading home appliances and furnishings chain retailer, it is its second biggest store, following just the Stockholm shop in Sweden. The new building covers 43,000 square metres, whereas the old one in Madian had around 15,000 square metres. 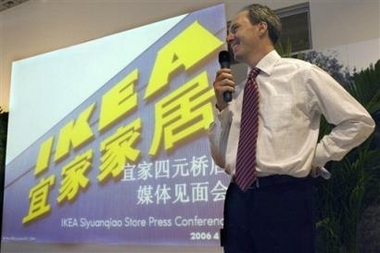 There are plans to have 10 IKEA branches in China by 2010, the firm said. The new building is located by the Fourth Ring Road in northeast Beijing. The old one was next to the heavily congested north section of the Third Ring Road where customers were inconvenienced by heavy traffic. The new store has 2,000 more products than the old one, giving customers around 7,000 items to consider buying. Construction, including buying the land in 2003, cost IKEA "very close to US$100 million, exceeding our expectations," said Ian Duffy, president of IKEA Asia Pacific. "We are excited about the many opportunities in Beijing," said Gillian Drakeford, store manager of the IKEA Siyuanqiao store. "In China, IKEA plans to open more and more stores. As part of its China expansion plan, the opening of the Beijing Siyuanqiao store also symbolizes a significant step in this process. We hope Beijing citizens will love more of our products and get more inspiration from the room-settings and have a lot of fun at IKEA." 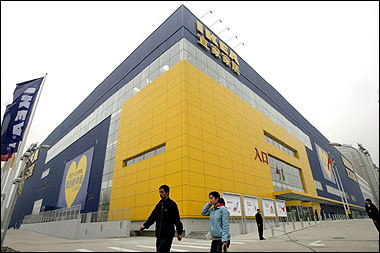 Since it first entered China in 1998, IKEA has opened three stores here, respectively in Shanghai, Beijing and Guangzhou. The Guangzhou store opened its doors last October while the original Madian branch in Beijing was the second of the Chinese shops, opening in 1999. Duffy said the firm aims to have ten stores in China by 2010 and this year it will open a branch in Chengdu, kicking off business in Northwest China. He said IKEA's next stop would be Shenzhen, with "the debut time in 2007". He added: "We also want to set up second stores in Shanghai and Beijing to meet increasing demand, but cities in Northwest China won't be the choice for the ten store expansion plan." "However, in the future, IKEA will keep an expansion speed of opening one or two stores each year," Duffy added. IKEA has built three floors of underground parking with more than 1,200 free parking spaces. It is also preparing a free shuttle bus service from Dongzhimen (the north corner of Beijng's Second Ring Road) to the Siyuanqiao store, 12 times a day.